In 2007, after serving as a teacher at Nicaragua Christian Academy and learning more of Nicaragua’s culture and struggle, missionary Mike Deibert prayed for God’s continued call for him in Nicaragua. God had always given Mike a heart for the arts, and his earlier training included blacksmithing and graphic design. 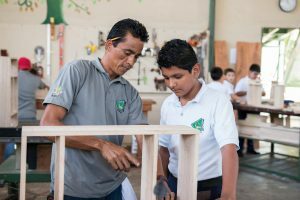 He was given the vision of a vocational school, a building, and some interested students, and God set things into motioning a small village outside of Managua called Los Brasiles. Mike soon found that the 35 young students had minimal critical thinking skills and weak foundati ons in both language and math. It became clear that Mike could use blacksmithing to teach critical thinking, walking students through the process of problem-solving. Also, the school and work environment opened the door to discussions, prayer, and study about what it meant to be a man of God both in and outside of church. The school began to shape its focus towards transforming the whole man in Christ. In January of 2011, ESVO opened its second school in collaboration with Nicaragua Christian Academy Nejapa. 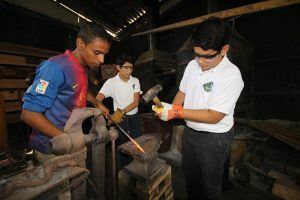 This new ESVO school served as a central training location for apprentices and as the vocational program for the Nicaragua Christian Academy middle and high school. Mike Deibert and Dave Boone worked together to direct the school and apprenticeship program. The Deiberts were called back to the United States in 2015, and the Boone family continue to serve as directors of ESVO. Now the school has expanded to include carpentry and welding. For women, there are classes in mosaics, jewelry, sewing, cooking and candle-making. On the shop wall are the words from Proverbs 22:29: “Have you seen a man skilled in his work? He will stand before Kings.” The purpose in teaching vocational skills to young Nicaraguan men and women is to encourage and equip them to live a life in Christ. This means the transformation of the whole person for Christ’s kingdom: within his or her family, church, and workplace. We pray that God molds these students into leaders who have a heart for God. It is these leaders who will then work with God to transform this country and its people by sharing Christ with their families, their churches, their communities, and their co-workers.